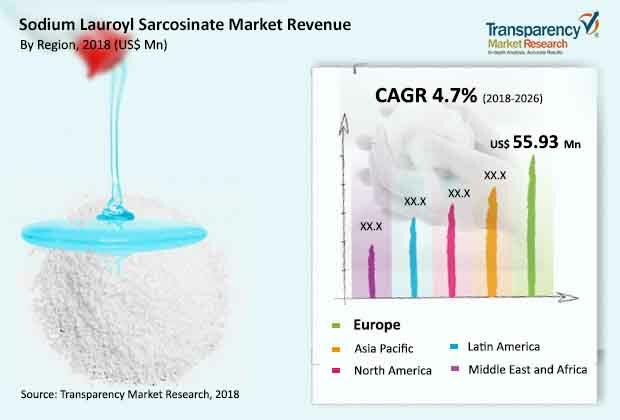 Transparency Market Research (TMR) finds that the global sodium lauroyl sarcosinate market has a competitive landscape. Some of the key players are operating in the global sodium lauroyl sarcosinate market are Galaxy Surfactants Ltd., Clariant Ltd., Innospec Inc., Stepan Company, Croda International Plc, Schill + Seilacher GmbH, Jarchem Industries Inc., and Shanghai Oli Enterprises Co., Ltd. These manufacturers are increasingly focusing on the developing market and industrial sector in the countries such as India, South Korea, and China. The players such as Cloariant and Innospec are taking efforts to improve brand value and entering to new markets. Also, these companies are entering in to short-time or a long-time partnerships to improve their customer reach. TMR anticipated that the revenue of the sodium lauroyl sarcosinate market was valued at US$ 163.8 mn and expected to expand with a CAGR of 4.7% over the forecast period. On the basis of form, the liquid form segment dominated the global sodium lauroyl sarcosinate market in terms of volume in 2017. On the basis of end-user industry, the skin care segment has accounted for more than 42% share of the sodium lauroyl sarcosinate market in 2017. On the basis of region, Europe has accounted for leading share of more than 33% in the global sodium lauroyl sarcosinate market. This growth is attributable to the high number of small-scale and large-scale manufacturers and suppliers of the sodium lauroyl sarcosinate are present in the European market. Mild surfactant products helps in reducing the skin damage and prevention of hair loss. The products for personal care manufactured from sodium lauroyl sarcosinate are sulfate-free products. The sulfate-free products are helps to reduce scalp problems and especially to retain the moisture in the scalp. The demand for the sulfate-free products due to increasing awareness among population is driving growth of the global sodium lauroyl sarcosinate market. Moreover, increasing concerns about sulfate-containing products and shift in the demand toward organic products are key factors driving the market. Natural and organic personal care products are manufactured by using plants as key ingredients. Plants are grown organically without adding chemicals or pesticides. Rising demand for chemical-free skin care and hair care products and changing approach of consumers toward organic personal care have also promoted the growth of the organic personal care industry. Formulations containing hard surfactants such as sodium laurel sulfate (SLS) are found to be toxic. The detergent action of SLS leads to dryness and roughness. Moreover, sulfate-containing surfactants remove beneficial bacteria that are essential in maintaining the scalp healthy. Sulfate-containing surfactants have the potential to cause chronic skin irritation, leading to hair thinning and noticeable hair loss. These factors drive the demand for mild surfactants and are expected to augment the sodium lauroyl sarcosinate market in the near future. High cost of manufacturing of mild surfactants is slightly more than sulfate-based products. High cost is key restraining growth of the global sodium lauroyl sarcosinate market. Nevertheless, the usage of are cost-effective materials and they offer effective cleansing, foaming, rheology control, and polymer deposition. Thus, cost-effective products are creating numerous growth opportunities for the key players the sodium lauroyl sarcosinate market in the near future.